— Henry Adams (1838-1918). The tenor of US political rhetoric has changed little over the last 195 years. I have always been interested in the fact that some planets have atmospheres and others do not. 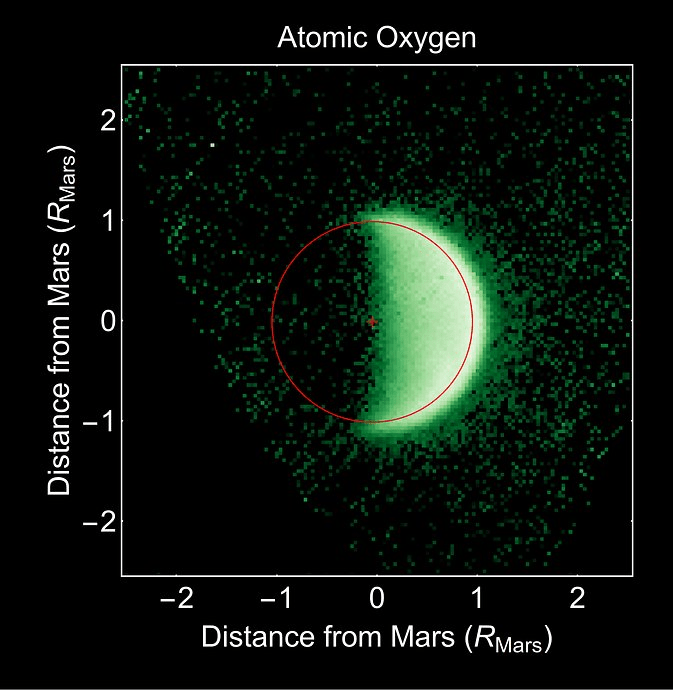 At the time of formation, planets have a primary atmosphere that consists largely of light elements (hydrogen and helium) – Earth now has a secondary atmosphere formed outgassing from tectonic activity and comet impact residue. For small bodies, these low-molecular weight elements escape into space. I had never looked at how these gases escaped until I recently found a Wikipedia article about how gases escape from planetary atmospheres (e.g. Figure 1), and the math and physics involved were too enticing to pass up. This post will focus on Jeans escape, a mechanism that depends on fraction of gas molecules at sufficiently high temperatures having enough velocity to escape a planet's gravitational field. While Jeans escape is not a major source of atmospheric loss for Earth, it is an important factor for smaller worlds like the moon and Mars. My Mathcad source and its PDF are here. I saw Figure 2 on this Quora post and I decided to learn about the meaning of this plot by regenerating it using Mathcad. The average speed of a molecule is given by Equation 1 (Source). is the mean velocity of a gas molecule. R is universal gas constant constant. MW is the molecular weight of the gas. T is the exobase temperature of gas (absolute). I should point out that I found conflicting information on exobase temperatures, which I document here. We can calculate the escape velocity from a planet using Equation 2 to determine when gas leakage will be significant on long time scales (Source). M is the mass of the planet. R is the radius of the planet. 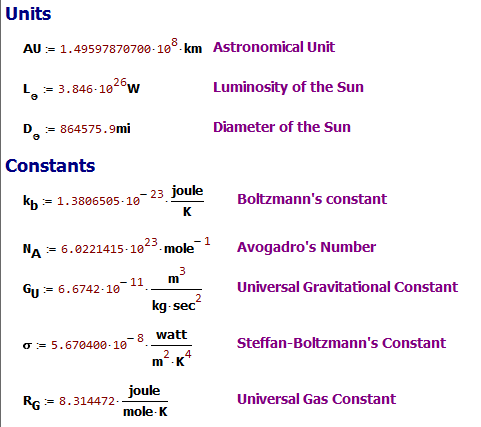 G is universal gravitational constant. ve is the escape velocity from the planet. Many analyses of the planetary gas leakage make use of the following rule of thumb (Source). 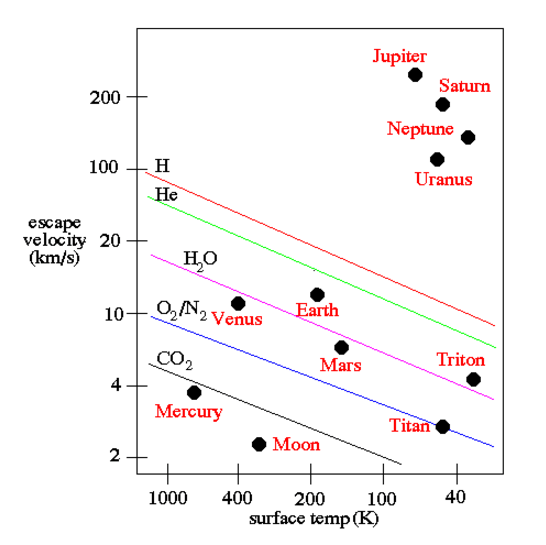 Calculations show that if the escape velocity of a planet exceeds the average speed of a given type of molecule by a factor of 6 or more, then these molecules will not have escaped in significant amounts during the lifetime of the solar system. Figures 4(a) and 4(b) show how I setup my calculation. 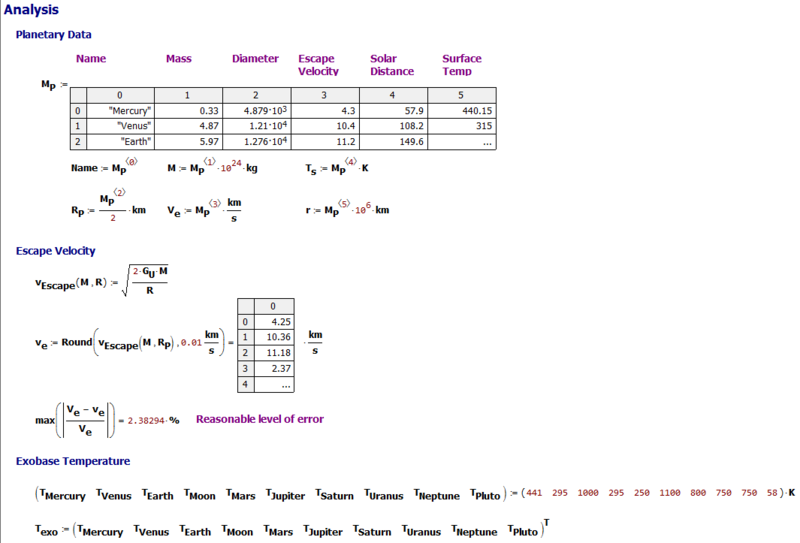 Figure 4 (a): Calculation Setup. Figure 4(b): Load in Planet Data. 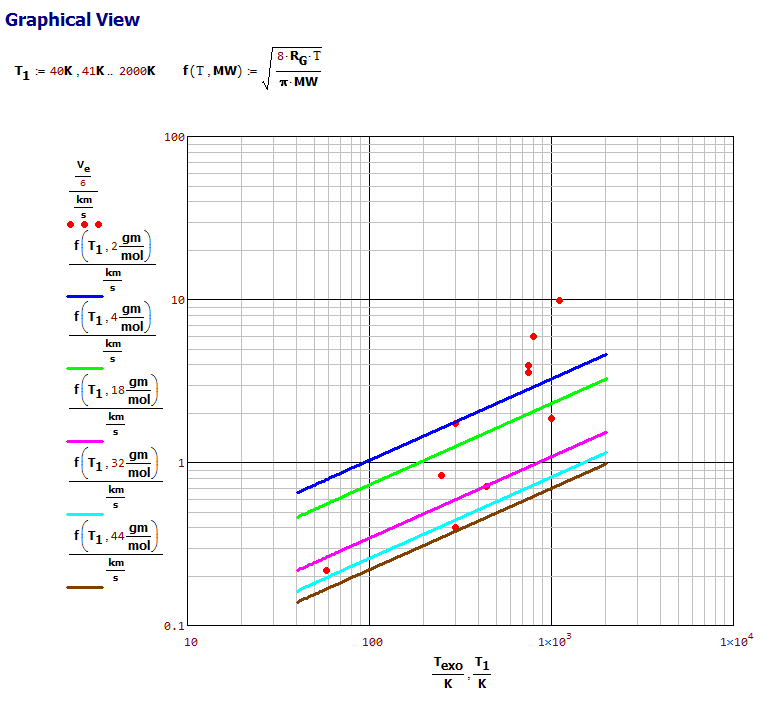 Figure 5 shows how I plotted my data in Mathcad. I am not happy with this plot because it does not look as clear as I would like. As an alternative, I plotted the data (Figure 6) using a presentation-grade graphics package. 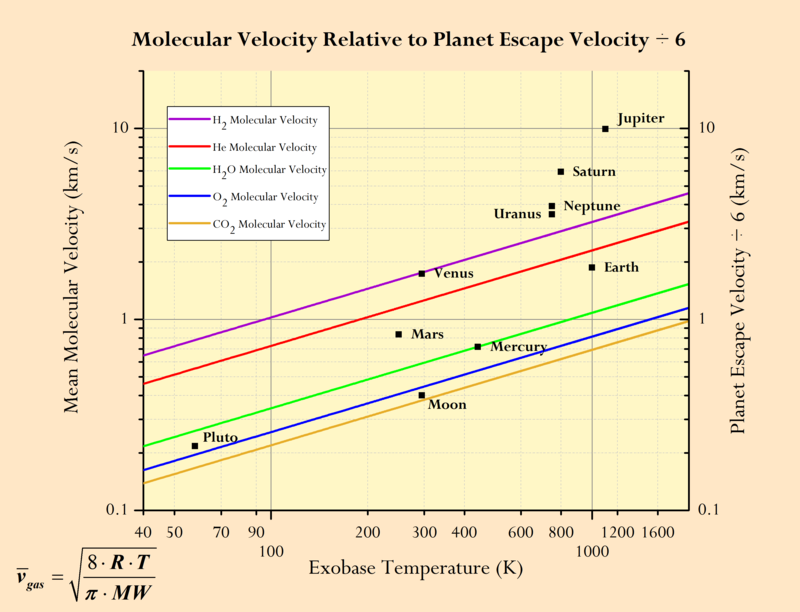 Figure 5: Plot of the Escape Velocity and the Planetary Escape Velocities ÷ 6. Figure 6 is a plot I made using the same data as in Mathcad but with the scientific plotting package called Originlab. 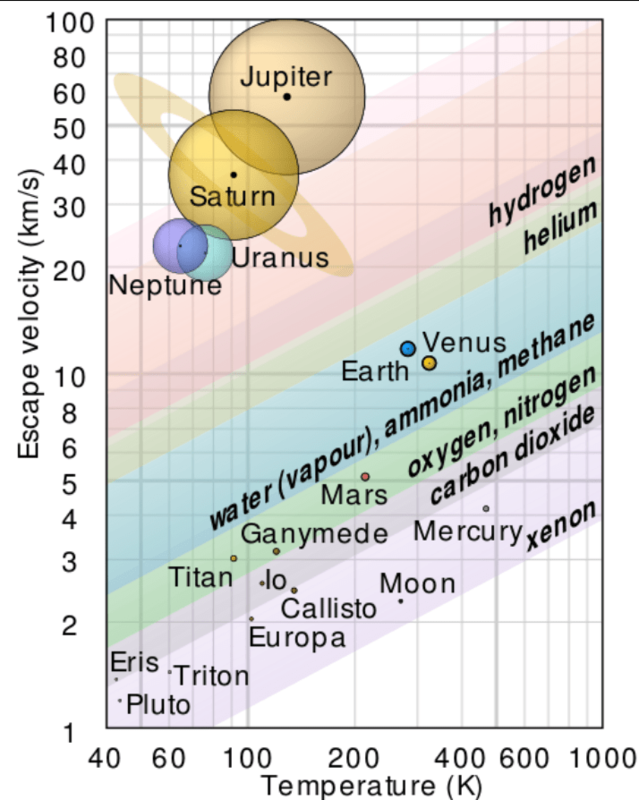 Figure 6: Gas Molecular Velocities Versus Planetary Escape Velocities ÷ 6. The terrestrial planets (Mercury, Venus, Earth, and Mars) do not have sufficient gravity to retain large amounts of hydrogen and helium. The gas and ice giants (Jupiter, Saturn, Uranus, and Neptune) have sufficient gravity to retain hydrogen and helium. The moon is large enough that it could retain some CO2, but in fact its atmosphere is almost nonexistent. This is because other mechanisms (e.g. solar radiation pressure) drove away what little gas was there. I have always wondered why hydrogen and helium have leaked away from the Earth's atmosphere, but oxygen, nitrogen, and carbon dioxide have remained. This plot shows me that the Earth is massive enough to retain these gases, but not massive enough to retain hydrogen and helium. Of course, other factors also play a role. For example, the Earth has a magnetic field that prevents our atmosphere from being eroded away by the solar wind. Mars is smaller than the Earth and has no magnetic field. This means that gases will be driven off by the solar wind. To show how complex this issue is, Venus is closer to the Sun than the Earth and has a much smaller geomagnetic field than the Earth. However, it has retained an enormous amount of carbon dioxide in its atmosphere and has developed an induced magnetic field in its ionosphere that helps minimize the impact of atmospheric erosion by the solar wind. Appendix A: Planetary Exobase Temperatures. 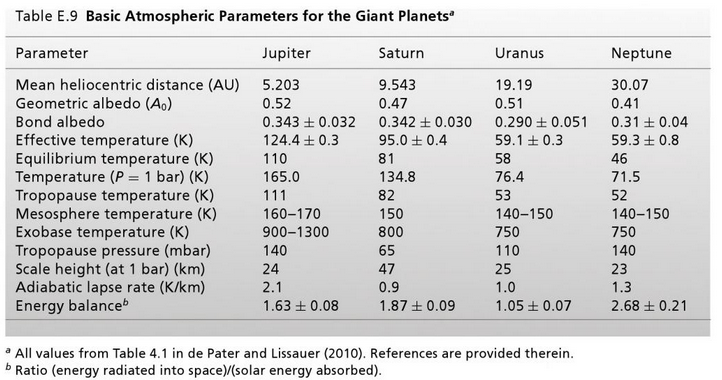 The following tables contain the exobase temperatures for the planet's of our solar system. Note that I found conflicting data for the the exobase temperatures of Mercury, Venus, and Jupiter. I chose to use this data for consistency. Appendix B: Conflicting Versions of Figure 6. Figure 9 shows another common form of my Figure 6. 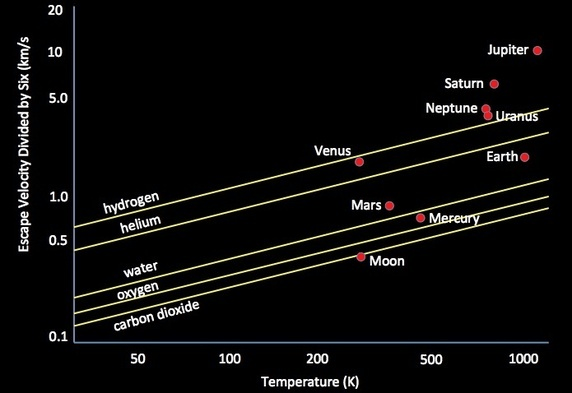 Notice that the x-axis is reversed and Jupiter, Saturn, Neptune, and Uranus have different exobase temperatures than in my Figure 6. Figure 9: Similar Example with Contradictory Information (Source). The Wikipedia also has a chart (Figure 10) based on data similar to that of Figure 9. I like the style of this graphic. Figure 10: Wikipedia Version of My Figure 6. Space scientists observe Io's atmospheric collapse during eclipse. "This research is the first time scientists have observed this phenomenon directly..."
Very cool!! Thank you for the link.